From left, Justin Koushyar 08MBA 16PhD, Peter Roberts, Li-Wei Chen 16PhD, and Wes Longhofer discuss research in progress. Mention the phrase social entrepreneurship, and it’s likely to conjure up inspiring notions of young business people with their sleeves rolled up toiling away for a good cause. But the rather naïve ideas typically associated with the term undermine the very real business acumen required to create a business organization that promotes social change. Social enterprise exists somewhere at the crossroads of the charitable and business worlds, with social entrepreneurs applying market-based solutions and business expertise to help solve specific societal or environmental problems. When done well, it’s all about moving beyond short-term fixes to the difficult challenges people face and achieving long-term change. Peter Roberts, professor of organization & management at Goizueta, admits that social entrepreneurship doesn’t have a clear definition, be it in academic circles, business leadership, or the nonprofit world. Much of the debate about terminology arises from the fact that the field is still in its infancy, and the study of it even newer. If a universally accepted definition were to exist, Roberts says it would have to take into account the externalities associated with it. “Traditional entrepreneurs create wealth for themselves, but social entrepreneurs work to create value for others,” he says. It’s less about coming up with a hard and fast definition than it is about pushing the work and the research to support it, admits Roberts. That’s where Social Enterprise @ Goizueta (SE@G) comes into the picture. As academic director of SE@G, Roberts oversees the research center as it capitalizes on a multifaceted approach to understanding and building upon the mission of social enterprises. “Simply put, the role of SE@G is to figure out how to make businesses and markets work better for more people,” he says. The program partners with a wide spectrum of for-profit, nonprofit, and hybrid organizations, with faculty and students not only doing in-depth research into social entrepreneurship but also volunteering their expertise to community organizations in the Metro Atlanta area and abroad. SE@G takes a three-pronged approach. 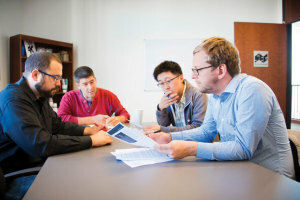 Research is a hallmark, with faculty and students involved in rigorous investigations that build on the school’s relationships in the business and charitable worlds, as well as in the scholarly community at Goizueta and beyond. Fieldwork and outreach at SE@G engage professors and students in real-world projects, creating social change both in Atlanta and in communities outside the US. Teaching and student support activities run the gamut from targeted classes for BBA and MBA students, to mentoring and fellowship opportunities, to active impact investing and consulting. By touching all these bases, SE@G is better able to learn about the work of effective social entrepreneurs, as well as to take real-time information and apply it in the field, Roberts says. While social entrepreneurship continues to gain traction, there is scant research on it, he admits. Roberts views SE@G’s research-focused efforts as an important step in effectively measuring the results generated in the nascent world of social enterprise. Without those measurements and evaluations, he says, social entrepreneurs are simply spinning their wheels. At SE@G, research takes place both within and beyond the academic setting, with students and faculty working directly with organizations and current data to assess and improve the societal impact of social enterprises. “It’s academic research in practice,” says Sean Peters, SE@G program director. Peters oversees the Impact of Entrepreneurship Database program, which collects data from entrepreneurs through active partnerships with accelerator programs. These data help the accelerators to better understand the entrepreneurs they attract and support. In addition to the database project, a number of other research streams underpin the activities of SE@G, including work by faculty and students on microfinance, company sponsorship of philanthropic foundations, and the cross-national dimensions of charitable activity. Chen is also working with Roberts and others on research projects that examine B Corporations and the drivers of their social performance. “Social enterprise is a real hybrid, and so we wanted to understand how the backgrounds of founding teams affect their emergence and social performance,” says Chen. The preliminary findings seem to indicate that B-Corp founders are more likely to come from the nonprofit world, but even more interestingly, high-performing B Corps are more likely to have a woman on the founding team. For example, SE@G is partnering with CDF: A Collective Action Initiative, a community-based nonprofit organization, to deliver the Start:ME accelerator program. The program leverages the Village Capital model of peer-based enterprise development to create a unique 14-week experience for entrepreneurs in Clarkston, GA. Promising micro-entrepreneurs are offered the business know-how, networking opportunities, and early-stage financing necessary to develop their businesses. Since 2013, 30 entrepreneurs have completed the program, and six ventures have received low-interest business loans. In 2015 the Start:ME program will expand to support additional micro-entrepreneurs in other Metro Atlanta communities, starting with the East Lake neighborhoods, thanks to a new partnership with the East Lake Foundation. Whenever possible, the Start:ME program brings Emory students into its communities. Jeff Kim 15MBA served as a business mentor to the 2014 Clarkston entrepreneurs, while Eva Zenilman 14C and Jonathan Cheng 15BBA offered weekly support to the same cohort. “We believe that these early exposures to real micro-entrepreneurs will help us develop a new breed of social entrepreneurs in the years ahead,” says Roberts.